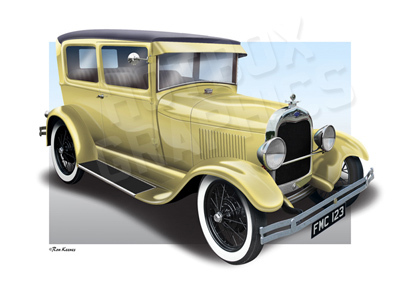 The Ford Model A was the replacement for the Model T and was produced between 1927 and 1931. The Model A was the first Ford to use the standard set of driver controls with conventional clutch and brake pedals; throttle and gearshift. It was available in a wide variety of styles: Coupe, Business Coupe, Sport Coupe, Roadster Coupe, Convertible Cabriolet, Convertible Sedan, Phaeton), Tudor Sedan, Town Car, Fordor, Fordor (3-window), Victoria, Station Wagon, Taxicab, Truck, and Commercial. This illustration is of the 1929 Tudor. Please let us know what wheels, colour etc you have, so we can create an accurate image. Ideally, if you send a photo of your car, that will be a great help!